On and Off-site catering is available. Submit your request online http://chickiesandpetes.com/parties-and-catering/parties-and-catering-request-form/ or call us at 609-344-1080. Chickie’s and Pete’s Crab House and Sports Bar is located just off the casino floor and the Boardwalk. This two story, 16,000 square foot full service restaurant and sports bar offers an extensive menu as well as its world famous Crab Fries. In addition to over 50 TV’s, Chickie’s and Pete’s offers the latest in audio and video technology, as well as the PLAY2 interactive sports bar concept. I asked for a quiet corner when I booked my reservation. They did bring me to a quiet fonder! Very tentative waitress. Delicious food, I'll be back! This was my second visit to Chickie & Pete's, and was quite satisfied. When you have a good server and good food, you can't go wrong. wants it all, shame on them! Reservation was ready when we arrived, we were seated immediately. Our server was excellent. Food was good. We had an enjoyable time. Will return. View of ocean was great. Waitress was very charming and attentive. Food came out in time for us to return to seminar. They forgot to credit us with Open Table reservation. Surroundings were decent for fast food chain restaurant. Food was barely average. Not bad but average. If you eat in chain restaurants, you may not feel the same. I do not, if I can avoid it. My choices and time were limited due to seminar schedule. I like to dine at restaurants who cook better than I do. There were so many empty tables, they sat us next to a noisy party. Waitress was great, friendly. lobster tail were great, but the hot spicy shrimp was not what we expected. We had a group of 7 to watch the Birds. Loss sucked. But overall we had a good time. 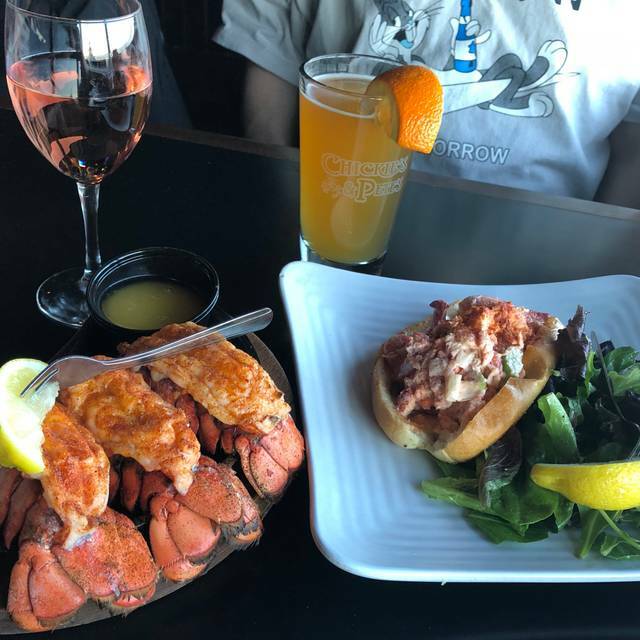 The lobster roll was excellent. Shrimp cocktail was great. Fantastic time. My mom turned 75 on Sunday and is a huge EAGLES fan. My 2 sisters and I reserved a table for the game. Our waitress was the best. Great time, awesome win in the last seconds of the game. Highly recommend watching all sports there. Went with 8 friends for NFL playoffs. Great bar table with multiple TVs to watch. Good burgers and other "bar food". Tons of beer at very reasonable prices. Amazing service too -- all good!!!!! Service was spot on for our party of 10. With TVs viewable from every seat we were able to catch the Wild Card games over beer towers, burgers, cheese steaks and last but certainly not least, their famous fries. We come here every year to celebrate the first birthday of the year and are never disappointed by the quick, friendly, attentive service, great seats for watching games and the signatures eats. The snow crab legs were served cold. 2 of my guest did not get their dinner with the rest of my guest. Came out 15 minutes later. Manager did accommodate the error and did not charge us. Our waitress was great but she needed help clearing the table. No bus help which is unfortunate. Overall it was okay. We were given a table right next to the window facing the ocean. It was a lovely view. The food was delicious and stayed warm throughout the meal. My husband enjoyed the fresh raw bar and the shrimp. The fries are great! We had an excellent lunch at Chickie’s & Pete’s. The service and food was fantastic. Chickie's and Pete's at The Tropicana in Atlantic City was amazing. Service was phenomenal and the food was the perfect portioned meal. We left full. Dined there before a concert. Get a seat in the back near the window with a view of the beach in the background. You can't go wrong. Had the best time..great service! We ordered crab legs for the first time and loved them. Chicken wings were Awesome as well and a great value. The food was good and reasonable. The service was a mess! As usual, the seafood at Chickie's & Pete's was sooooo good. The crowd was lively and watching the football game (which Penn State won). It was a really great time! It was okay. We looked online for specials and is the reason we went for a seafood special. The server knew nothing about it and asked the manager who also did not know of any specials. At least this time we got service. Last time we went and sat at the bar for 5 minutes d was totally ignored by the bartender. So we left thought we would try again. Sarah was awesome but the table wasn’t cleaned they had very little staff and one of the meals didn’t come out till 15 mins later. The one male server was very rude as we where celebrating a birthday and it took over 20 mins to get a dessert. Not a good feel for us to celebrate a birthday party. We love Chickie and Petes and go often in PA. The food was nothing like what we eat in PA, it was bland, we ordered mussels white, asked for the bread that goes with it to be told they had no bread and no substitutions were offered? We ordered 3 desserts - two came out together, the last one came out 15 minutes later (chocolate ice cream cake) on a tiny plate for us to be told they ran out of large plates. The booth was dirty, i had to ask for it to be cleaned and the bathrooms were horrible. I would not return to this location for dinner. Dungeons crab was an expensive disappointment. Clearly frozen too long and or cooked too long. Getting our crab bites AFTER our meal shows disorganization. Excellent seafood. The crab fries were great as usual and the service was outstanding. Server was simply bad. Misrepresented one of the meals when asked about it before ordering. When 2 of the 3 meals came out after 5 minutes and the other one 15 minutes later, she replied that all items are brought out as soon as they're ready. Our app came out 10 minutes after that, after we asked about it and got a blank expression, so assuming it was never put in. Food was very good. Quick bite for late night snacks with the family. Our server Tarrell was super friendly and very efficient! Needed more napkins for the crab. My husbands king crab was steamed too much. For 28.00 should be perfect. My snow crab was good but, messy. Def need to give wet wipes. The waitress told me where the bathrooms were to wash my hands after eating..a bit odd. The food was very good. The service not so. The server was adequate, but did not pay attention to certain requests. Although warned beforehand, the food came out at different times, but the time between being served was extremely long. Our server, Brendon, was awesome! The hostesses were not all that great but this seems to be par for the course at Chickie and Petes. Fortunately the service is awesome and food is good. Only reason i didnt give stars on everything was the wait for our food was entirely too long. Our food I'm 99% positive was given to a table 3 tables down that sat approx 30 min after us and had same server. When runner brought out food to table behind us. Then couple min after server walked by looked at our table and had the look where is their food? Then looked down at other table, then walked back to us and said I'm sorry taking so long I'm going to go check on that. I was a server for 14 years, I know that look and the play it off routine. We had a 9 PM reservation so not eating til 1015 was just a bit to late. Chickie's and Pete's has great seafood. Their shrimp tacos were great and so were the 3 mini lobster tails. Make sure to order something to go along with it, or you might still be hungry.